During his nearly 40 years in broadcasting, the late Howard Cosell did more to popularize television sports than any other sportscaster in this century. Mr. Cosell is probably best known for his 13 years of expert commentary on ABC's Emmy Award winning "Monday Night Football". In 1977, he became a commentator on ABC's "Monday Night Baseball". Cosell gained worldwide recognition and fame as the voice of boxing including most of Muhammad Ali's major bouts. 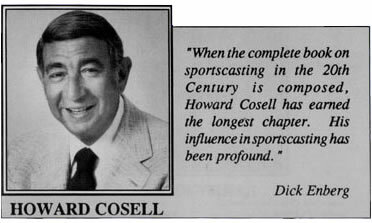 Howard Cosell's impact on sports extends beyond the commentator's booth. Considered the pioneer of television sports journalism, his three-time Emmy Award winning "ABC Sportsbeat" premiered in 1981 as the only regularly scheduled network program devoted solely to sports journalism. After leaving television, Mr. Cosell remained active in radio with his daily sportscast, "Speaking of Sports", and his weekly interview program, "Speaking of Everything". Howard retired from ABC radio in 1992. Cosell left his personal imprint on the sportscasting field. Known for his candor in reporting, he was never afraid to "tell it like it is". He was also an accomplished interviewer who did not hesitate to ask the tough questions. Mr. Cosell's involvement in sports started in his native Brooklyn where he was the sports editor of his high school paper. He went on to New York University School of Law and was admitted to the bar in 1939. He began his sportscasting career in 1953 as the host of a New York area Little League baseball program for ABC radio. Sports was more than Cosell's profession, it became his life, second only to his late wife, Emmy, who was his best friend and greatest fan.